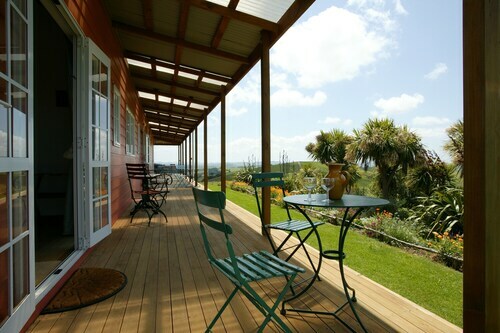 Situated in a rural location, this bed & breakfast is in the same area as Kauri Museum. Situated in a rural location, this luxury apartment building is within 9 mi (15 km) of Te Arai Reserve, Forestry Beach, and Mangawhai Heads Beach. Lang's Beach and Pakiri Beach are also within 16 mi (25 km). Situated by the ocean, this bed & breakfast is 0.9 mi (1.5 km) from Lang's Beach and 1.7 mi (2.8 km) from Waipu Cove Beach. Mangawhai Heads Beach is 7.6 mi (12.3 km) away. Offering direct access to the beach, this Waipu aparthotel is 0.1 mi (0.1 km) from Waipu Cove Beach and 1.9 mi (3.1 km) from Lang's Beach. Mangawhai Heads Beach and Ruakaka Beach are also within 12 mi (20 km). You'll discover just 1 hotel within a 10-kilometre radius of Tinopai. About 55 kilometres away from Tinopai is Whangarei, which has a range of hotel and apartment options, such as the Lodge Bordeaux and Lupton Lodge. 5 kilometres from the main part of Tinopai is the Petite Provence Bed & Breakfast. Don't be a drongo and miss out on the other cool things to see and do in Northland. View Northland's beaches, coastal plains, forests and rivers. In addition you could explore a few of the area's historic mansions. More active visitors may try their hand at mountain biking and mountain climbing in this part of New Zealand. The nearest hotels in North Island are Mangawhai and Mangawhai Heads. Mangawhai is 35 kilometres to the east of Tinopai, while Mangawhai Heads is 35 kilometres to the northeast of Tinopai. Mangawhai accommodations are the Tudor Oaks Motel and Mangawhai Retreat Apartments. 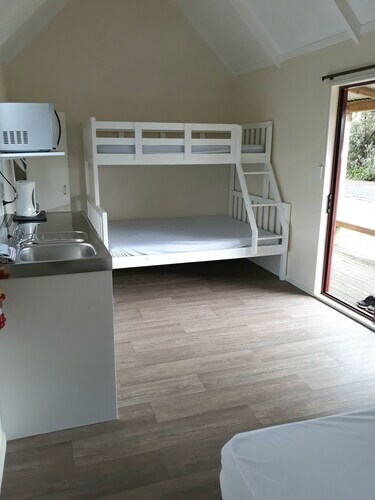 The Mangawhai Heads Holiday Park and Mangawhai Chalets are amongst the accommodation options in Mangawhai Heads. Australia has some of the world's greatest sports lovers, so why not indulge with a visit to Eden Park? Find Eden Park 90 kilometres to the southeast of Tinopai. Book a hotel nearby to the action at the Sofitel Auckland Viaduct Harbour or the Quest on Beaumont. If you are transiting into or out of Whangarei Airport and plan to stay nearby, check out the latest deals at the Distinction Whangarei Hotel & Conference Centre or the Kauri Nest. How Much is a Hotel Room in Tinopai? Hotels in Tinopai start at NZ$122 per night. Prices and availability subject to change. Additional terms may apply. We enjoyed the two-bedroom unit. Great views and close proximity to Manawhai's Estuary. The unit's kitchen had everything we could possibly need, including a full-size refrigerator. The livingroom furniture has been well-used and was not comfortable to sit on, for us. That would have been more of a problem if we'd stayed longer than one night. Overall, we enjoyed our stay. The lay out was good. The motel was clean and tidy and close to the beach.